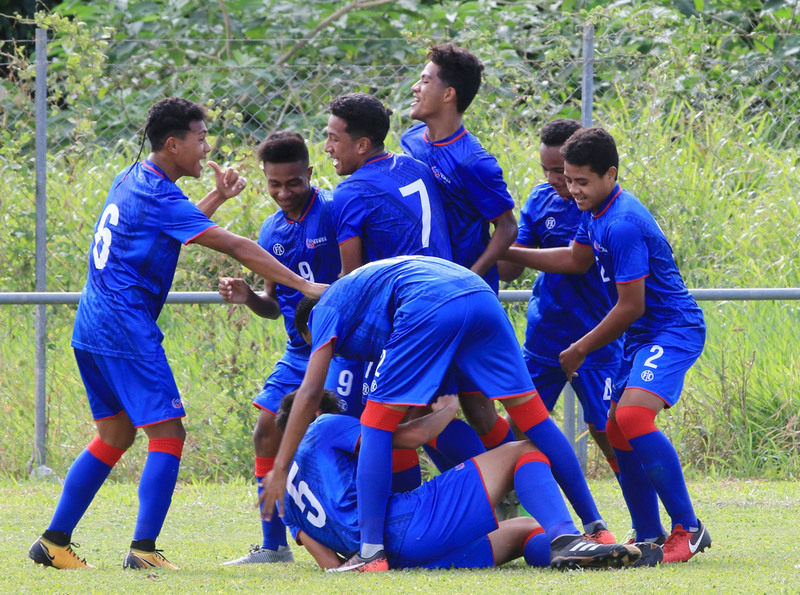 Pressing high paid off for Samoa as they secured a 3-0 win over Cook Islands to open their OFC U-16 Championship Qualifier account while Tonga set local hearts aflutter with a stunning comeback against American Samoa to earn a 2-2 draw. American Samoa used experience to their advantage fielding a starting line-up that boasted seven U-19 representatives including captain Gabriel Taumua who is a dual futsal/football international who is appearing in his sixth regional youth competition. That level of experience shone through as Taumua was the rock at the back of a side which looked confident on attack with newcomer Peter Lauvao proving an excellent addition in midfield while Ina Vaieli and Milo Tiatia threatened up front. Despite dominating the first half action American Samoa struggled to find a way past a back line intent on keeping them at bay, with goalkeeper Viliami Lui making several impressive saves much to his opponent’s chagrin. Both sides were left with a lot to think about at the break and it was Ruben Luvu’s American Samoa which eventually broke the deadlock. Peter Lauvao, who moved higher for the second half, made an impressive run before lashing a shot at Lui, the ball was parried away and played back to an arriving Tiatia who looped his long range shot over the keeper. Set-piece maestro Gabriel Taumua was next on the scoresheet after he curled a free kick from the top of the box around the wall and inside the upright in the 53rd minute. Perhaps American Samoa felt a two goal lead was comfortable enough, or perhaps Tonga needed to be behind to kick them into gear but the home side started to find their feet which resulted in much quicker counter attacks and more pressure from up front. They were rewarded for their perseverance in the 58th minute when Henry Tuiono pounced on a fumble from Antonio Nauer, poking it home for Tonga’s first goal of the tournament. That ignited the Tongan side and had American Samoa scrambling, so much so that when a shot came in on target a momentary lapse in judgement from Joseph Collins who blocked with his arm, saw him sent off and Tonga awarded a penalty. Captain Joseph Muavesi stepped up for his side and fired past Nauer to pull Tonga level. American Samoa looked broken as cramp started affecting the players while Tonga only seemed to grow in stature with the home crowd right behind them. An emotional Tonga coach Lafaele Moala was delighted his side were able to find their way back into the encounter, dedicating the draw to the late Emmie Sope, OFC Just Play Programme Manager, whose work in the region included introducing a number of the Tongan U-16 squad to football. “In the first half I think the boys didn’t stick to the game plan and it was also the first time for them to play an international. You saw in the second half they came back and I was excited about the way the game went,” he said. “Today’s game, I told them it was for Emmie,” Moale said. “And I know that’s why they played really hard because without Emmie, they might not be representing their country. I think the feeling in them, that’s why they did their best and didn’t want to back down. They never gave up. Having to share the points with their opponent wasn’t easy for Ruben Luvu after his side impressed so much in the opening half of the match. “Tonga’s a very good team, they’re young and have a good team. We were leading, but I think the boys slacked down a little bit,” Luvu said. Luvu said a switch up of the formation today helped balance the squad which he found effective. “I changed from a 4-4-2 to a 4-3-3 for more balance, more attacking and more defending when needed,” he stated. A determination to stick to their formations and game plans was how Samoa and Cook Islands opened the tournament at the Loto-Tonga Soka Centre earlier in the day. This approach laid the ground work for an even opening half with possession won and lost by both sides however the Samoan defence proved a lot harder to break down. The Cook Islands front line were forced to drop deep into midfield to win possession with Brayden Kamana doing a fantastic job of that, but when it came to switching on a collective offence the side struggled to get a decent shot on target. Samoa on the other hand were hugely effective with their high pressing game plan, heaping the pressure on a Cook Islands defence led by captain Tumatangi Tumatangi, another of the tournament’s U-19 internationals. Cook Islands withstood the pressure as long as they could but were unable to keep pace with the swift, strong passing of their opponents. Samoa eventually broke down the walls in the 37th minute when Jarvis Filimalae beat past his marker to fire home from a tight angle and opening the scoring. Fetuao Belcher then made it 2-0 before the break when managed to finish a set piece that had bounded around in the six-yard box and off the woodwork before he finally got the sweet touch it needed to cross the line. Although Cook Islands never gave up, they continued to be dominated by Samoa in the second half with a third and final goal finally coming in the 75th minute. Filimalae latched onto an excellent pass before dribbling towards goal and firing a low, hard shot past a diving Jireh Vunibaka. Samoa coach Martin Tamasese was happy to start the competition on a positive note. “I’m really happy with the boys today. We prepared really well and had Plan A and Plan B. We planned to put pressure and counter today,” he said. Anthony Samuela was a bit more downbeat after the final whistle but believes the game only leaves room for improvement from his side. “I want to thank the Samoa team firstly for their effort. It didn’t go our way but I think the boys should learn something from there and get better for the next game,” Samuela said.